2 Bdrm Terraced Villa (end terr). Ground flr: Lounge. Kitch. Cloakrm with wc. 1st flr: 2 Bdrms. Bathrm (CT band - D). Garden. Parking. 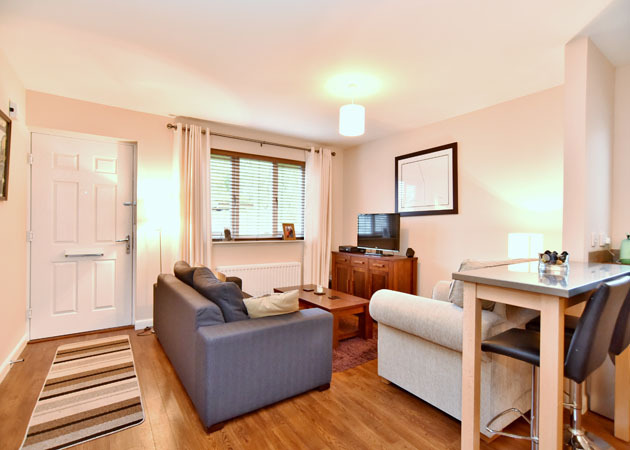 Fixed price £147,500 Entry by arr. Viewing contact solicitors. (EPC band - C). 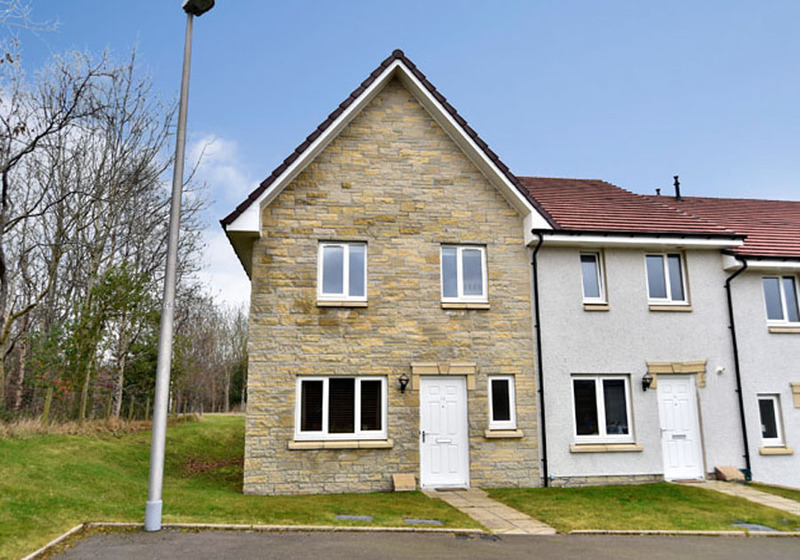 Kingswells is a popular expanding residential area linked to the City by good commuter roads with the location being particularly convenient for the Airport and the oil related offices at Dyce, Westhill and Hill of Rubislaw and for a wide range of other offices at the west end of the city. 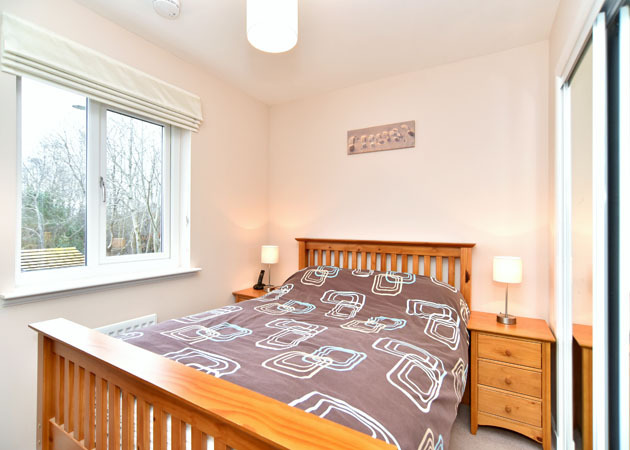 The area itself is well served by local shops, public transport facilities, Primary School, Nursery and Medical Centre. DIRECTIONS From the West end of Union Street continue on to Alford Place, Albyn Place and Queen’s Road, travel straight ahead on to the A944 Aberdeen-Alford Road. At the Kingswells roundabout, take the last exit and turn right at the traffic lights on to Kingswood Drive and then right again into Bellfield View. LOUNGE: 13’6” x 11’ approx. West facing Lounge area creating a pleasant bright airy living environment with Amtico flooring, wooden blinds, stainless steel curtain pole, TV point and recess/storage area. KITCHEN: 10’8” x 6’6” approx. 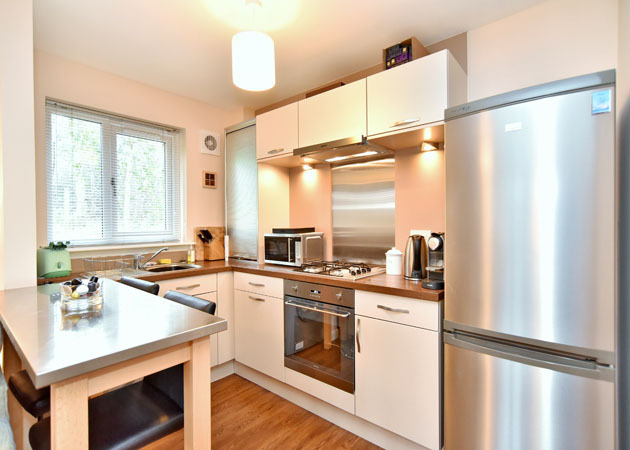 The open plan Kitchen has an extensive range of base and wall units with integrated Four Ring Gas Hob with Electric Oven below, glazed splashback behind and Extractor above set into stainless steel Canopy, stainless steel sink unit with mixer tap, integrated dishwasher, automatic washing machine, fridge/freezer and storage cupboard, stairway to upper floor. . N.B. The Dishwasher, Automatic Washing Machine, Oven and Fridge/Freezer are all included in the price. 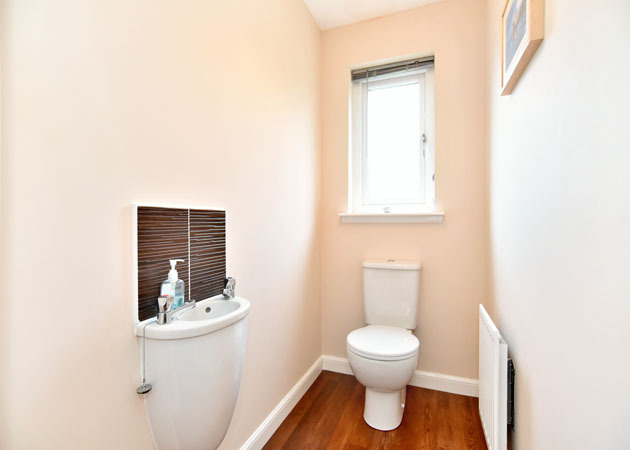 CLOAKROOM: Cloakroom with white w.c., and w.h.b., and Amtico flooring. HALL: Hall with access hatch to loft, airing cupboard. BEDROOM: 9’10” x 8’ approx. 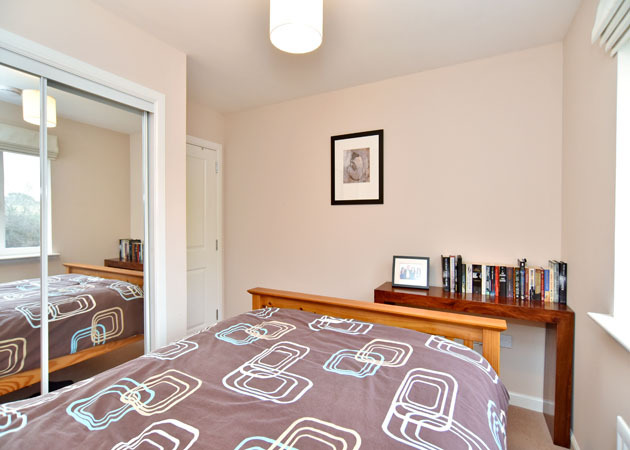 Double Bedroom with double fitted wardrobe with shelf and hanging space and two sliding mirror doors, TV point. BEDROOM: 10’4” x 7’6” approx. 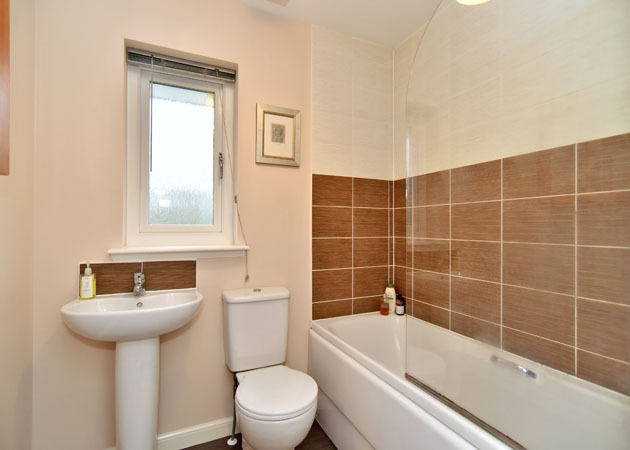 BATHROOM: Bathroom with white suite, tiled splashbacks, fitted thermostatic shower over bath, glazed shower screen, venetian blind, medicine cabinet with mirror doors, vinyl flooring, extractor fan. GENERAL: The carpets and Amtico floor finishes, curtains, blinds, and light fitments are all to be included in the price. OUTSIDE: Allocated parking space directly outside of property. Visitors parking. 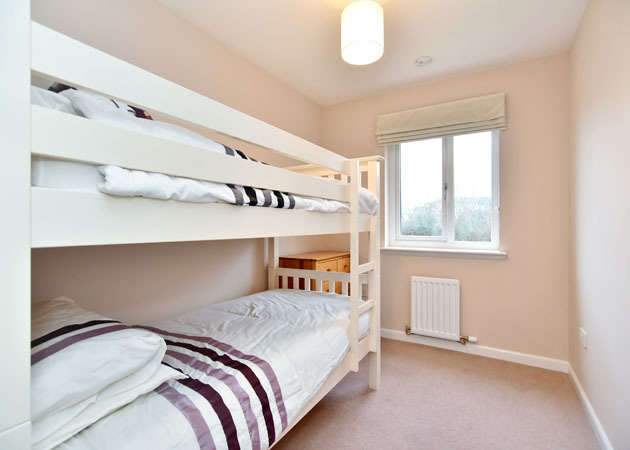 The amenity areas within the entire development are professionally maintained for which a factoring charge is payable. Shared bicycle store.